The Austrian motorcycle company, KTM showcased its new KTM 1050 Adventure at the EICMA in Milan. This bike can easily be seen as an entry point into the world of KTM enduros with its reasonable price and lighter and lower fuel consumption. 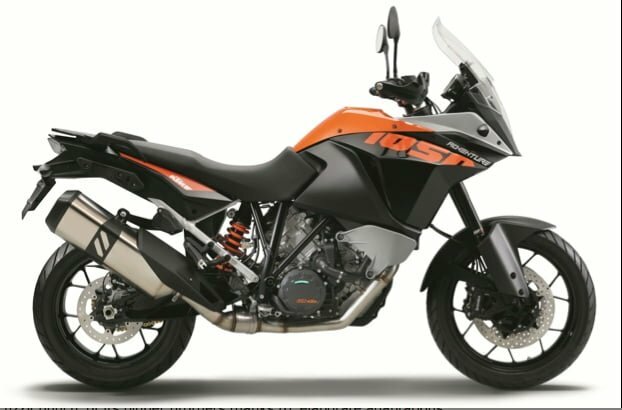 Although it isn’t the bike that high powered travel bikers were looking for, it holds it’s position as a younger sibling in front of the giants in the KTM lineup which include the KTM 1190 Adventure, KTM Adventure R 1190 and KTM 1290 Super Adventure. The newly unveiled bike proudly flaunts the same 1190 engine, only slightly smaller and pretty much the same power and torque upto 95 hp. With the A2 license compatiblity, the bikes is the perfect “entry level” bike for enthusiasts. Along with the manageable power the bike is also an inch or lower than it’s bigger brothers which makes it easier to mount and the smaller sized tires make it easier to steer through. The KTM 1050 also presents itself with the prize-winning Tourance Next tires from Metzeler and is well equipped for any speed one wants, from cruising to very fast speeds. The KTM 1050 Adventure has a 2 cylinder, 4 stroke, V- Twin engine with spark-ignition and is liquid-cooled. This makes the ATB bike easy to ride and should give fair grunt for difficult terrains and maneuver around hurdles on the off road track. The bike also has an electrical starting aid, a forced lubrication with 3 rotor pumps. With regard to cooling system, the engine has a continuous circulation of cooling liquid with a water pump. The clutch is PASC anti hopping which is hydraulically operated. The ignition is as stellar as its counterparts, fully electronic, requires no contact and works with a digital ignition timing adjustment. The primary gear ratio is a standard 40:76 as it is for most other travel bikes by KTM. The 1050 cc bike has a powder coated tubular space frame, a three level traction control and an anti-lock breaking system. With a WP suspension up side down and monoshock the bike should stay in line for tricky trails. The front brake system includes two Brembo radially mounted four piston brake calipers and the rear system has Brembo fixed mounted two piston brake calipers, these accompany a Bosch 9M+ Two Channel brake system. This highly functional brake system should hold up even on thrashed roads. The vehicle has an average 440 kg maximum permissible weight and a 230 kg weight without fuel. The bike boasts an adjustable windscreen, handlebars and foot peg and a throttle-by-wire technology which basically means that it has several options for riding module. KTM has also presented various options for customization according to individual needs. The model should launch in Europe in 2015 and be available in India in knocked down version (CKD) priced at a 10.10 lakhs. According to its current specifications the bike should do adequately well in India, but may be overlooked in front of the 800cc bikes. Regardless, KTM has given its best shot at this, trying to reach out to a wider customer base and to the more generic biking addict.